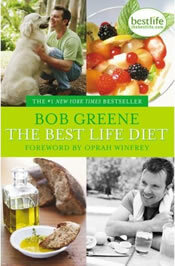 Bob Greene’s Best Life Diet is a healthy-diet-and-lifestyle book by author Bob Greene. “A way of eating – for life. It’s based on a well-balanced regimen of interesting, satisfying, nutrient-rich, and easy-to-find-and-prepare foods. The Best Life Diet guides you to develop healthy eating habits and a healthy lifestyle, for weight loss and to maintain a healthy weight. The program does this in 3 phases. Objective: More activity, establishing meal patterns. Following an initial weigh-in, the diet program stipulates 3 meals (including breakfast) plus at least 1 snack daily, and no eating during minimum 2 hours before bedtime. Plenty of water but no alcohol, and daily supplements. Increase physical activity. Weigh-in after 4 weeks, and move on if ready – that is, if all the daily objectives are being met consistently, and the overall weight loss has been more than a pound or thereabouts per week. If not, stay on phase 1 for 2 or 3 weeks longer. Objective: Significant and consistent weight loss through control of hunger and dietary changes. Weigh in at start, and then every week. Develop understanding of the physical and emotional reasons for your hunger, and use the hunger scale. Eat reasonable food portions, and remove 6 foods from your diet that are ’empty’ or are problem foods. Physical activity may be increased. Check weight-loss after 4 weeks and move on if ready. If you’re within 20 pounds of achieving your weight goal, and the weight-loss has stopped, move to Phase 3. Otherwise, stay with Phase 2 until your regular weekly weigh-in says you can progress. Objective: Continue to improve quality of diet for good health and weight maintenance. Weigh in at least each month, but no more often than once a week. Introduce other foods according to the calories advice given, and balance your diet using the guidelines, removing more unhealthy foods and adding wholesome ones. Physical activity may be increased. This is your healthy lifestyle from here on in. The Best Life Diet Website is operational and allows subscribers to track meal plans, cardio and strength training, and communicate with others following the diet. The Best Life Diet book details a program that has many good features and has achieved good results. The book includes some 75 pages of recipes and a recipe index, as well as full meal plans for 2 weeks. Greene, B. (2008). The Best Life Diet Revised and Updated. Simon and Schuster. I don’t really like this diet, I didn’t lose any weight at all, Everyone should try Dr. Amanda’s don’t go hungry diet!!!!!!!!!!!!!!!!!!!!!!!!! !